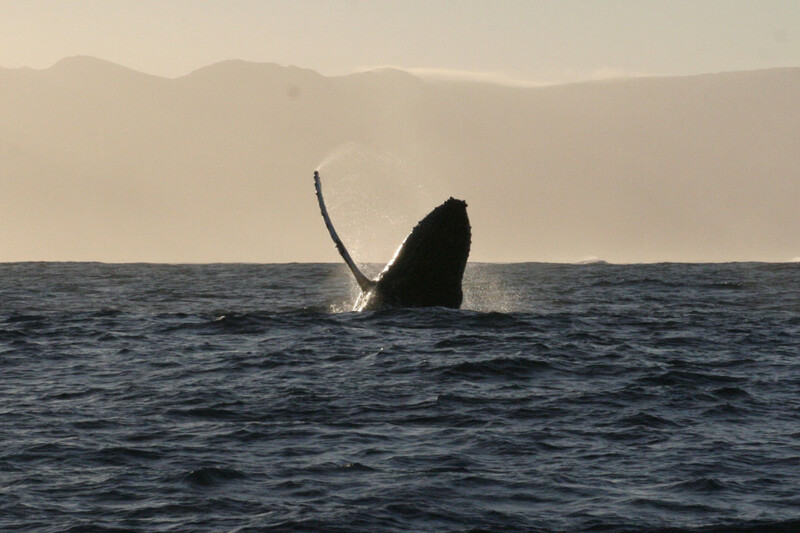 Between June and August, sightings of the Humpback whales Hermanus are common, as they follow their migratory path towards their breeding grounds in the warmer waters of the Indian Ocean. Like the Southern Right, this whale feeds on krill, copepods & amphipods but also feeds on small pelagic fish. Humpback Whales are easily recognizable by their long flippers, humped back with a dorsal fin, and the distinctive white markings on the underside of their flukes (tails). The white markings on the underside of a Humpback whales fluke (tail) are unique to each whale, much like the callosities, and a humans fingerprint. The Humpback whale displays a very impressive ‘breach’. Humpback whales can grow up to 16 metres (52 ft) with weights that exceed 40 tons. Book your whale watching adventure in Hermanus with Southern Right Charters today.